There are certain licenses in this world that simply have never gotten the 1/6th scale treatment they deserve. Sometimes this is because of licensing Hell, a situation that went on for years with the 1966 Batman television series, and has caused problems for others like the original Bladerunner. But that's not the only reason. Companies have always believed that the best success can be achieved when you can build a brand around a license. Just look at the success of brands like Star Wars, Marvel, or DC, from a company like Hot Toys. While every movie within the brand might be new, the brand remains consistent. And there are lots and lots of movies and TV shows out there that simply don't lend themselves to long term branding. 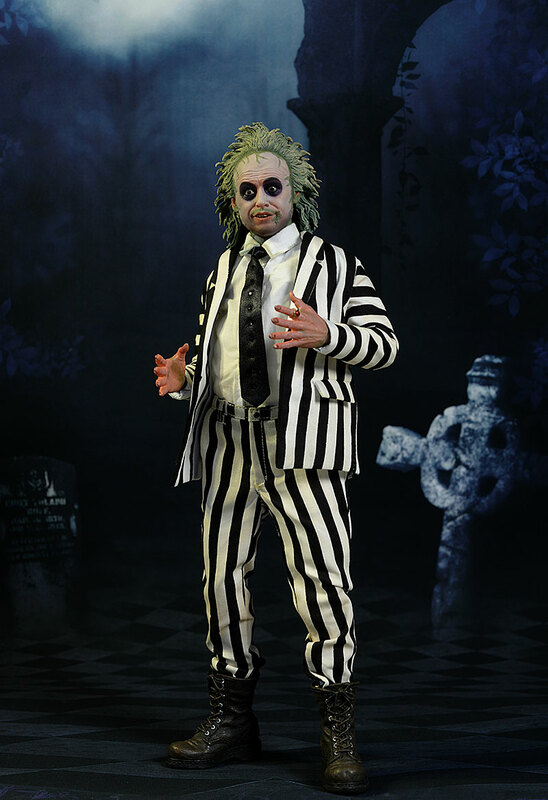 There's often just one really good character in the license, and this causes consternation for any company, including sixth scale manufacturers. They'll often look to find ways around this - think Movie Maniacs, Cinema of Fear, or Now Playing, where different companies created a single brand name to collect these one off characters. Sideshow took up the cause of lonely characters awhile back, seeing a hole in the market. The first such release was Snake Plissken, and they are following it up with Beetlejuice (reviewed tonight) and Ash from Evil Dead (review very soon, if shipping dates hold). Let's hope we see some more of these one off announcements by SDCC this summer. 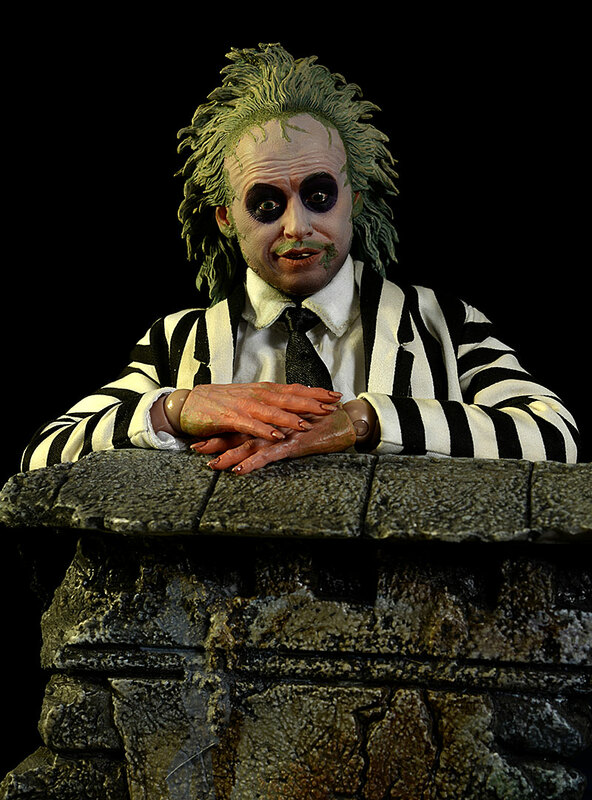 Beetlejuice is available as a single figure for $240, or as a combo with a tombstone diorama for $340. I have the tombstone coming, but it's shipping a couple weeks behind. You can also buy just the diorama for around $125. In the photo below, I've separated the top and bottom so yu can see both. 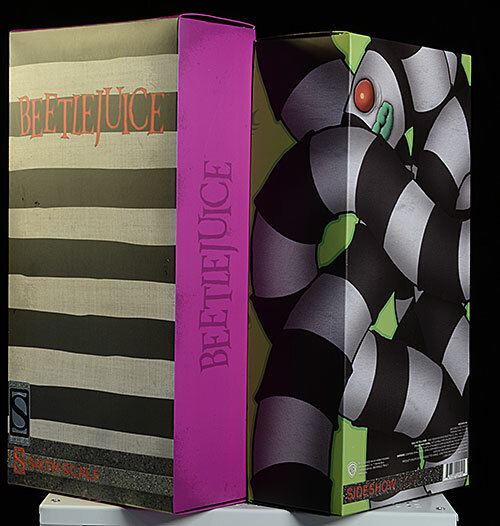 While it's just a regular shoe box design, I love the graphics, which work off the black and white stripes and their use in multiple ways in the film. Inside is a set of double plastic trays, which are wrapped by a cigar band style cardboard label, proclaiming "Here lies Betelgeuse". Everything is collector friendly of course, and this is one of their nicest packages in awhile. This category is going to be one of much - much - debate. Let's do this by the numbers, and start with the realism. 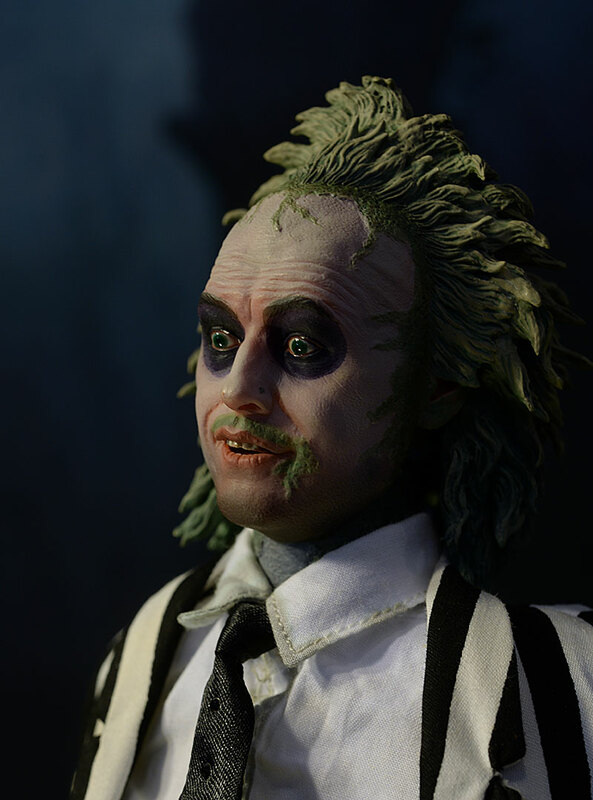 The sculpts coming out of Sideshow have greatly improved in this category, with some excellent skin texture, and a very realistic cracked, diseased look to the lips and mouth. The teeth look great, and the work around the eyes is very realistic as well. Even the fungal growth that passes for a hair line (and extends down the jaw and onto the neck) is well done. It's also worth noting that the detailed stranding in the funky hair looks quite good, and is an improvement over past attempts. 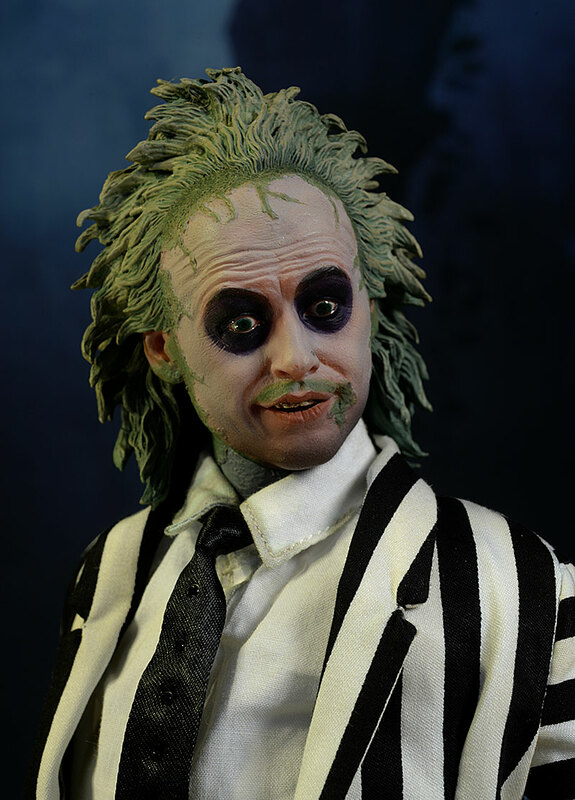 Then there's accuracy - does it actually look like Michael Keaton as Beetlejuice? The answer is a big yes. The shape of the jawline, the Cupid's Bow of his upper lip, even the shape of his nose, always a tricky area, seems just about right. 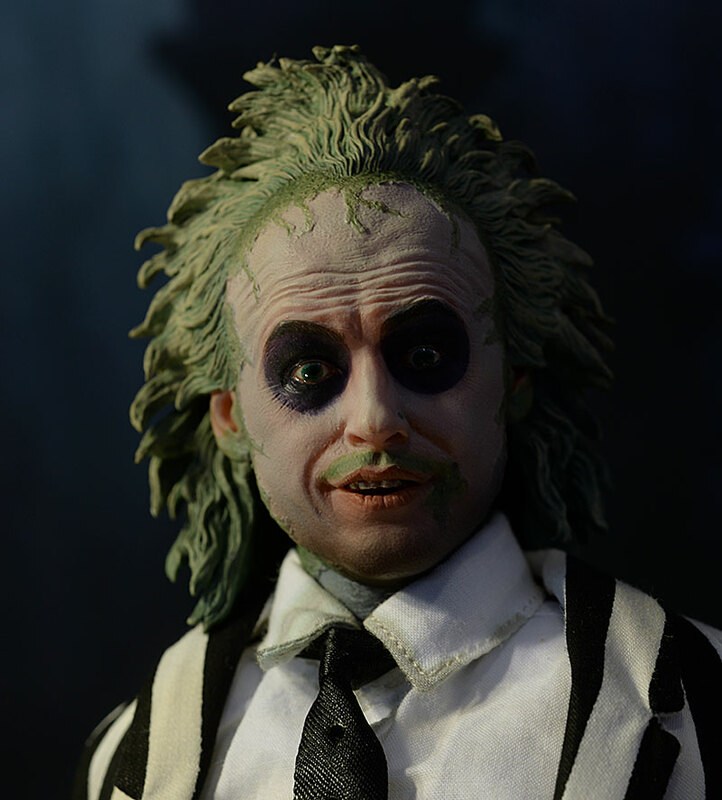 I have no trouble instantly recognizing Keaton in this sculpt. And then comes the emotive aspect. Sadly, this is where it falls completely apart for me. If I were grading on just the previous two aspects, I'd go at least *** - maybe even ***1/2. It's tough to know for sure, because the right expression, the right emotion might have taken this portrait over the top, or just brought it up to a decent level. But what they went with is just confusing, and does not work for me. I like the slight smirk, but it simply doesn't go with the shocked look in the eyes. I don't associated it with the character, it doesn't work with most body poses, and it tanks - for me - what could have been a great portrait. I suspect that even adjusting the eyes up, down or to one side, would have been an improvement. He's a little shorter than other characters, which seems appropriate, coming in at the full 12" if you measure all the way to the tip of his weird hair. This is the sort of paint job that will never look good in brightly lit close ups. The white face ends up washed out and the blackened eyes look too extreme, but in hand, with normal light, it looks quite good. Still not great, but certainly better than it appeared in some of those early photos. Everything is clean, perhaps a little too clean. The black around the eyes has a sharp transition to the white of the face, although they did try to blend it a bit around the bottom edge. The eyebrows are in there, but a little difficult to see, and the green color of the fungus and hair - including the facial stubble - is clean and consistent. Perhaps the best feature are the eyes, which have a glossy look that creates natural catch lights. The paint work continues down the neck, following the sculpted decay. There's not a lot of variation in the hair, but the sculpt allows for shadows to create depth and show off detail. I'm more torn in this category than I am in the Sculpt. There, I know exactly what has me tweaked - the expression. Here, the individual details seem reasonable, but the overall effect leaves me wanting. The underlying Sideshow body works fine, and is very tight. The joints will hold poses no problem, and the body is about as mobile as any other dude in a suit. The torso can turn and lean, and the hips, knees, elbows, shoulders, and wrists, all have a good, useful range of movement. He takes a slight hit in two areas, both pretty obvious. The ankles aren't going to do a lot in the sculpted boots, and the neck doesn't have much tilt or lean action, thanks to the long sculpted hair and the thickness of the underlying neck sculpt. I found I could pop the head off the post and still pose it on the neck, getting a better look. Considering the price point, here's a category where the figure takes a big hit. He comes with 11 hands, including the relaxed set he comes wearing. Each has its own wrist peg, a big plus. They swap easily, and 10 of the 11 are matching sets, which can be useful. The extra hand is permanently gripping a nail file. All the lefts are wearing his ring of course, and they all have creepy, nasty, fingernails and detailed skin textures. 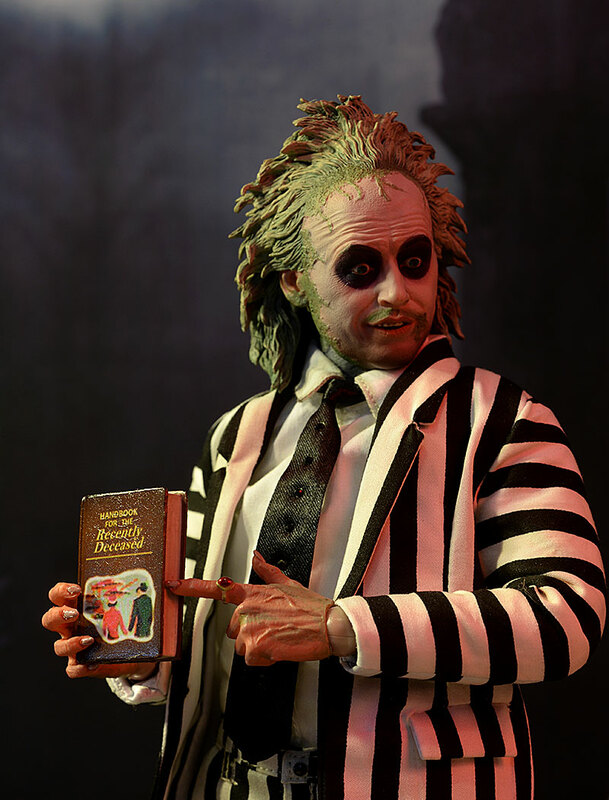 He also comes with the Handbook for the Recently Deceased, the tome featured so prominently in the film. It's pretty basic, but relatively screen accurate. Finally - yes, finally - there's a very basic display stand with support. And that's it. Some hands, the simple book, and a basic stand. Where's the second portrait? Maybe a shrunken head too? Or a second coat with long, bendy arms? At $240, all those things should be possible. Easily the best overall aspect of this figure is the costume, and I suspect we'll see sales of custom head sculpts jump as collectors scoop them up to pop on this figure. 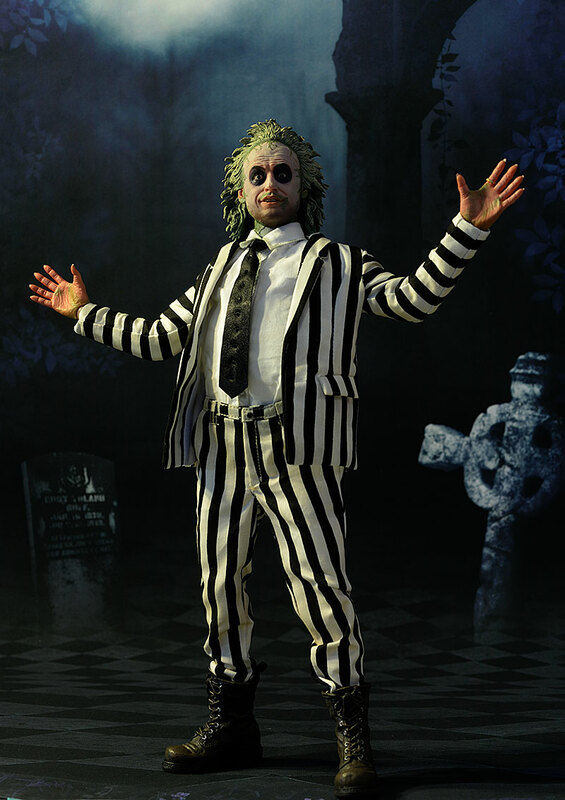 The suit, consisting of the pants, shirt, and jacket, is very well made and tailored. They've added an underlying fat suit to pack on a few pounds, and the overall look works. They even have the small buttons down the front of the tie, and they've added just the right amount of sweat and grime without going overboard. The final piece of the costume is the boots, which sport an excellent sculpt and paint job. While they might be restrictive, they look fantastic. While the articulation and assortment of hands allow for some interesting poses, the facial expression and lack of other accessories counteract the positives, leaving you with less potential overall. Ouch. I mean really, ouch. $240 is a lot for any sixth scale action figure right now, and that price point brings with it certain expectations. 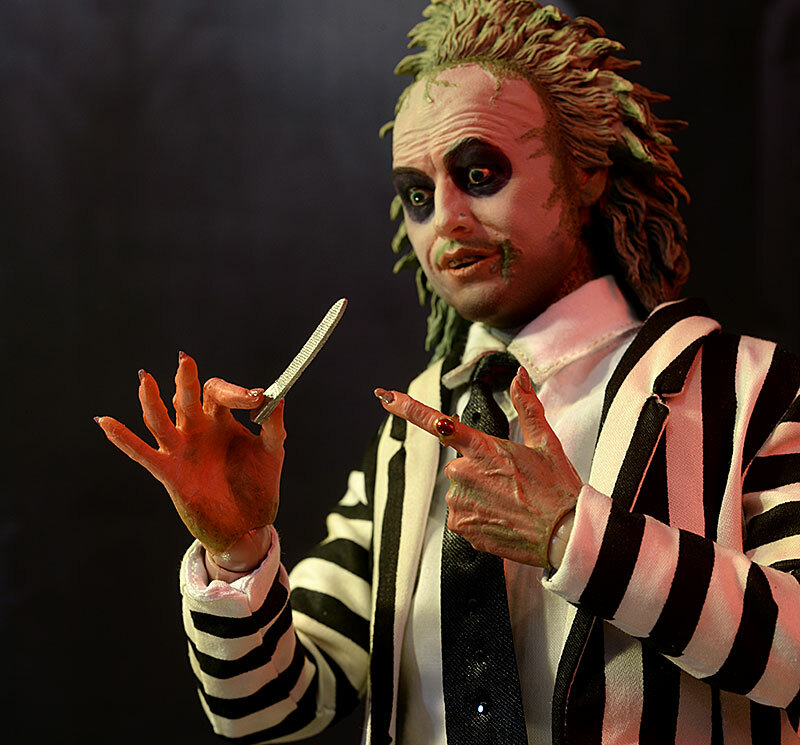 I just ragged on Hot Toys for giving us very little with their otherwise excellent Joker, and he was $20 cheaper than this. This figure is comparable to others in the $180 - $200 range tops, and that extra $40 - $60 is a killer. Not a thing. Everything is sturdy and well made, and I don't expect you'll have any issues with swapping hands. There are so many simple ways this figure could have been improved. Just drop the price $40 - $50 and get it in line with the rest of the market, and it jumps a half star overall. Better yet, add in some more accessories, especially a second head sculpt with a better, more iconic expression, and you could have a real winner. From the neck down, there's very little I'd change. And while this particular expression leaves me cold, the basic quality of the sculpt and paint implies a better expression could have resulted in the perfect figure. I'll also admit that this figure came *this* close to losing another half star. It was all around the Paint - if I went three stars there, I felt two and a half overall was the right spot. If I dropped the paint another half star, the overall would have to follow, especially at this ridiculous price point. After much time staring at the figure in hand, I went with the three stars in paint...but it was damn close. I bet it's not going to be long before we see some simple repaints on the eyes and it improves the look a tremendous amount. That still doesn't fix the 'surprised' wrinkles in the forehead, but it's a start. I think the bones are there, but it needs a little love to bring out its best. 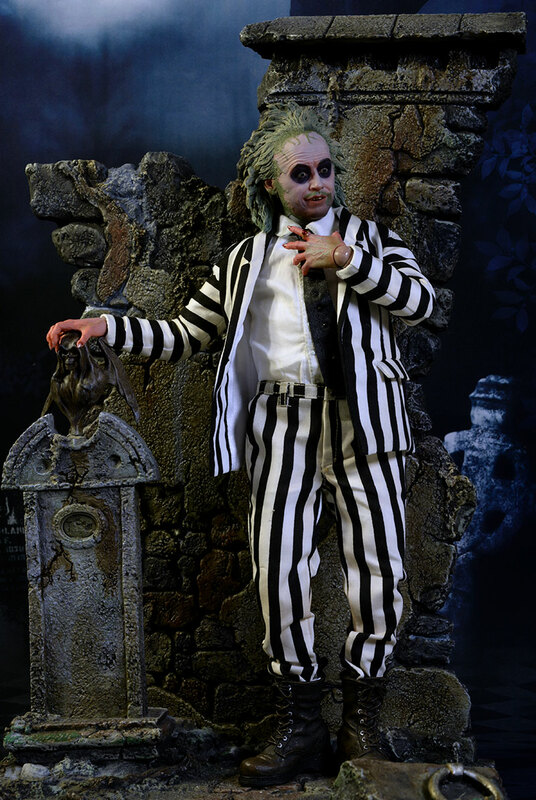 - has this figure for $240, and you can pick up the tombstone separately for $125. 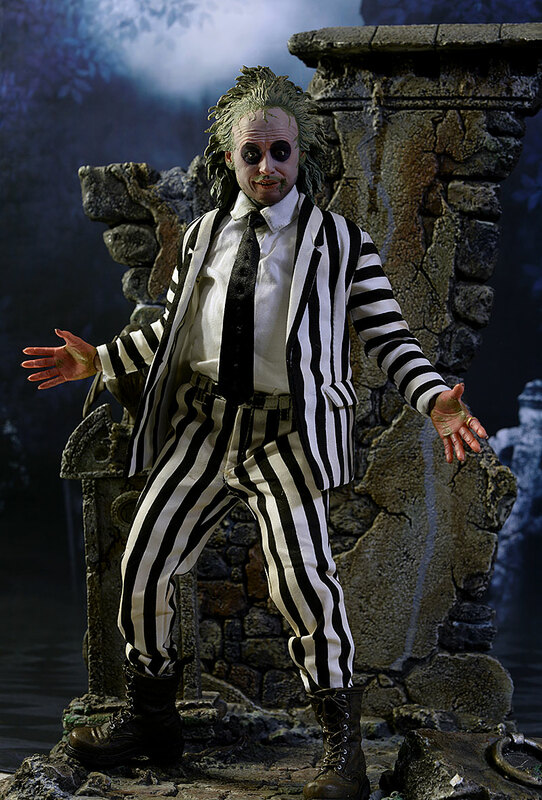 - has just the figure for $228, or with the tombstone for $345. 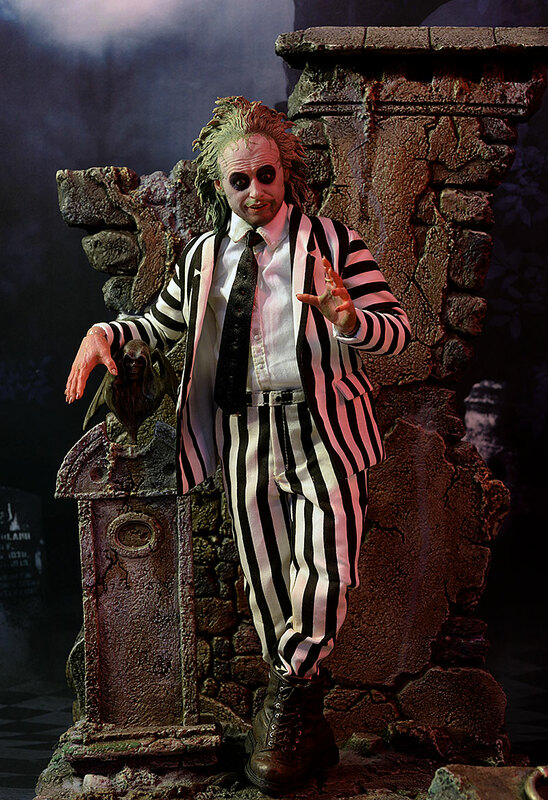 - Sideshow has the figure for $240 and the tombstone for $125, but if you buy them together, you get the set for $340. 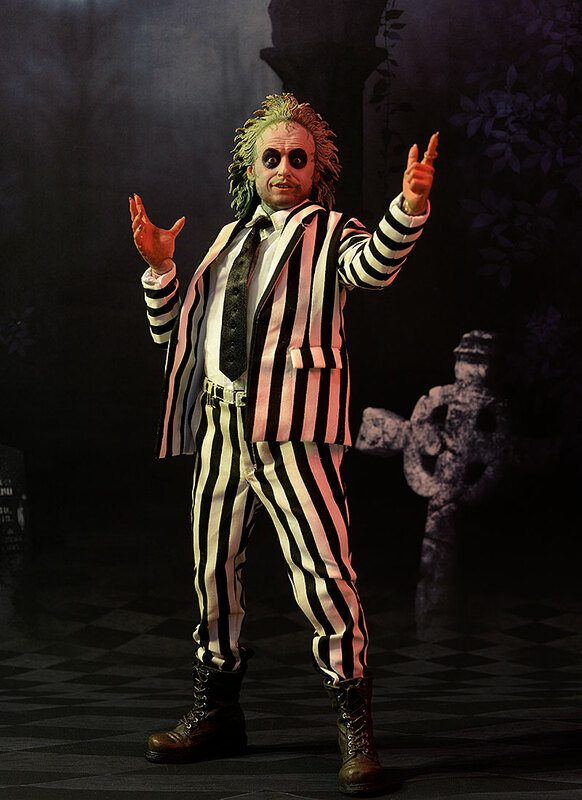 This is not the first Beetlejuice action figure, although the other licensed versions are in other scales, like the 18" version from NECA and the 7" version from NECA.